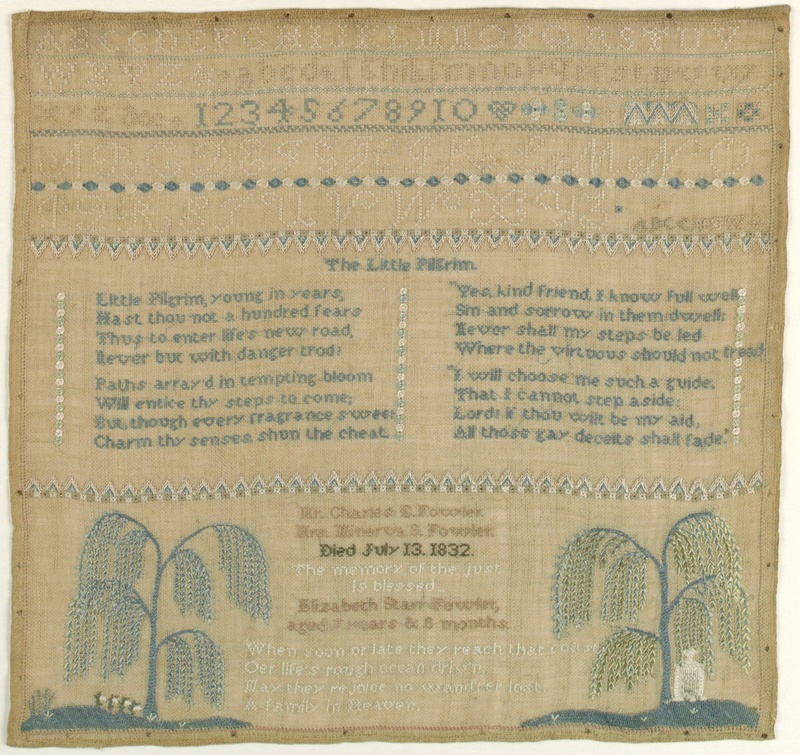 This sampler was worked by nine-year-old Elizabeth Starr Fowler (1822–1904) shortly after the death of her mother. It is unusual in that it combines elements of a traditional alphabet sampler with those of a mourning piece. At the top of the sampler are several rows of alphabets followed by a verse. The bottom section includes Elizabeth’s name and age, her parents’ names, and her mother’s death date framed by two weeping willows. Beneath one of the trees is a white tomb. Elizabeth was the only child of Charles Edward Fowler (1798–1876), a farmer, and Minerva Starr (1797–1832) of Guilford, Connecticut. Two years after Elizabeth’s mother died, Charles Fowler married his second wife, Mary Parmelee (1801–1882). In 1850, Elizabeth wed Beverly Monroe (1824–1906), a well-to-do merchant who later became the first Treasurer of the Guilford Savings Bank. The couple had two children, Mary (b. 1857) and John (b. 1862). Elizabeth and her husband were prominent members of Guilford society, and accounts of their activities, such as the 1887 purchase of a farm in Riverside, California, regularly appeared in area newspapers. The family lent several items, including a portrait, silver, and porcelain, to an exhibition commemorating the 250th anniversary of the settling of Guilford. Their Guilford residence – a house known as Charles Fowler Place, which Elizabeth inherited from her father – was torn down in 1937, but its image is preserved in a photograph.